Having a disability can present certain challenges if you want to fly. With advance planning at your departure and destination airports, you can overcome these hurdles. Disability assistance requires advance planning. This page hopefully will assist you. It is natural for people with disabilities to be as independent as they can. It is essential to plan in advance any disability assistance beforehand. For example, if you have walking difficulties, you can arrange for disability assistance by use of an airport transporter or wheelchair for instance. The European Parliament regulation EC1107/2006, states all European airports will operate a disability assistance service for passengers with reduced mobility. This has enabled all Spanish Airports, including Gran Canaria airport to provide a quality service that guarantees people with disabilities to air travel within European territory. As a result, a minimum of 48 hours notice should be given if a passenger requires disability assistance. However, at busy times more time may be required. This is because of safety regulations, because they can only accommodate a small number of people at any particular time on a flight. Our advice is to arrange the assistance you require as soon as possible. The airline you booked with will inform both airports of the type of assistance needed. The team of airport assistance providers will then be expecting you. They will meet you at the departure airport and have everything in place for you. Likewise they will get you to the aircraft assisted with equipment and with personal help. The destination airport will also be aware of the situation and have their ground team ready in place. Tip: Be precise and accurate as to exactly what assistance you need. Airports can be huge and at Gran Canaria airport there are large walking areas. Remember you need to get to your luggage collection, passport control and on to the arrivals hall. How to Procure Disability Assistance? Passengers need to request disability assistance at least 48 hours in advance. If your requirements change while in Gran Canaria it is good to contact Aena on +34 91 321 10 00 and inform them. Also you can visit Aena’s website for more information. If you navigate to the top right hand corner of the Home Page you can select your language. Navigate to the top left hand side of the Home page and click the button marked “Passengers”. Scroll down the page and you will notice a box marked “PRM assistance”. Click the drop down box menu to choose your airport. Choose your airport. On the next page there is an orange button “Request Assistance”. Click this button. On the next page fill in your details and request assistance. Important: Check that your request for assistance has been confirmed. Alternatively you can contact Gran Canaria Airport directly on: (+34) 91 321 10 00. At arrival at LPA Gran Canaria Airport you will be assisted in disembarking the plane. You will also be helped to go through passport control and taken to collect your luggage. You will then be taken to the meeting point of your choice. Go to the pre-arranged meeting point. If this has not be arranged, then in the departures hall, inform a member of staff that you have arrived and that you need disability assistance. There are also intercoms at fixed locations to inform the airport staff. They will ask you to wait there and then they will collect you. Passengers in need of disability assistance will be assisted during the check-in process and at the security checkpoints. This will continue until you are in your seat on the plane; helping with your luggage and personal needs. However, once on board the aircraft, airline staff will usually take over until the destination airport. Then the airport staff will assist in helping you with passport control and collecting your luggage. They will take you to the desired meeting point if you have arranged for someone there to take you out of the airport. Summary: Plan well in advance if possible and arrive at the airport in plenty of time. There are good facilities for the disabled at all the terminals of Gran Canaria airport. These include lifts, ramps and disabled spaces of all levels of the car park. There are a number of PRM disability assitance meeting points located on both floors at the airport with intercoms. 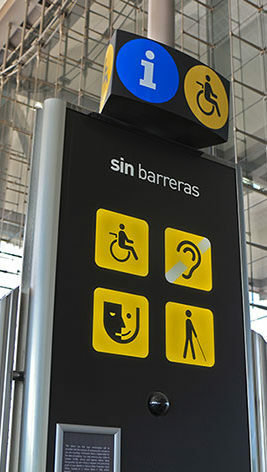 The Sin Barreras service at LPA Gran Canaria Airport is without charge for passengers requiring disability assistance and is operated by Aena, the Spanish airport company. The Sin Barreras (Without Barriers) service is excellent and will make any disabled passenger’s journey and members of their party a less stressful one. This must be initiated during the process of booking your flights. Passengers requesting disability assistance will notice an option to request assistance. Generally this is the procedure with most airlines. You should notice a section on the web page or a button that will direct you to the area of their website to make the application. Usually, you give your details and requirements by ticking boxes that specify various assistance that you need. 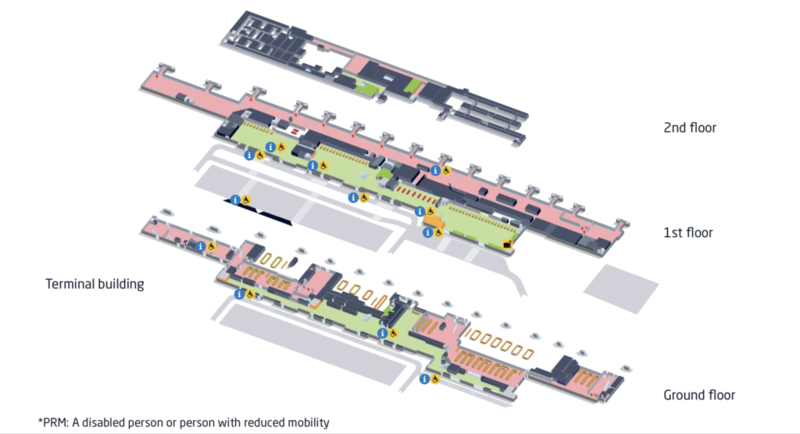 Each airline will transport your wheelchair and mobility equipment free of charge. However, it is imperative that you inform them of this when you buy your flights, especially if you have battery powered equipment. For instance, a folding wheelchair may be stored in the passenger cabin, if there is enough space on board. Therefore, if you require the use a wheelchair on board it has to be requested when booking. Please be aware that walking sticks and crutches will likely be taken off passengers for the duration of the flight and stored. Batteries must be disconnected for safety reasons. This will prevent batteries turning your equipment on during the flight or run the risk of short circuiting for instance. You will be transported to the entrance of the aircraft either in your own wheelchair or one they have provided. If your chair is a battery powered type it will have to be stored in the aircraft hold. Don’t forget to label your wheelchair or mobility equipment before you travel. From here passengers will be transferred to an on-board chair or boarding chair. Note: Depending upon the gate number, the wheelchair exchange location may vary depending on the boarding method and facilities available at your departure airport and LPA Gran Canaria airport. Depending on the type of aircraft and the type of help requested by passengers asking for disability assistance, special equipment may be used to help you board. With smaller aircraft, stair-climbing chairs are used to help passengers who cannot independently climb the steps to the airplane. With larger aircraft an Ambi-lift vehicle will usually be used to help passengers to board larger aircraft. Different carriers will have different policies regarding boarding. Some will require you to board before any of the other passengers and with others you will be boarded last. You must travel with a companion if you’re not self reliant. They need to assist you using the toilet, as cabin crew are not permitted to assist with the use of the toilet or to help lift passengers. Find out from your airline if they have a toilet with disabled access. Very few do but Easyjet have recently started to equip some of their new aircraft. However, on most aircraft the on-board toilet compartment is tiny, Remember also the on-board wheelchair can only be taken up to the toilet door. It will not fit inside. However there are rails and grab handles inside the on-board toilet compartment. As the doors open outward this helps the transition from wheelchair to the grab handles inside the toilet area. Therefore seeing that you have notified the airline during the booking process they will select a suitable seat for you, free of charge. If you’d prefer to choose your own seat there are some restrictions on where you can sit. The seats with extra leg room are often situated in the emergency exit rows. However, for safety reasons these seats cannot be occupied by any passengers requiring disability assistance. Therefore, if you require assistance and extra leg room, your airline will seat you at the front of the plane near to the toilets. If you require postural support for your flight you will have to bring your own equipment as your airline will not provide these. You will have to contact your airline beforehand to ensure that your postural support is suitable for the aircraft’s seats and for them to allocate a suitable seat. Postural supports are permitted but they must comply with the airline’s safety standards. These supports should be used in addition to the aircraft’s safety belt for instance. WCHR Wheelchair assistance required; passenger can walk short distance up or down stairs. WCHS Wheelchair assistance required; passenger can walk short distance, but not up or down stairs. WCHC Wheelchair required; passenger cannot walk any distance and will require the aisle chair to board. WCOB On-board aisle wheelchair requested (for use during flight). WCMP Passenger is traveling with a manual wheelchair. WCBD Passenger is traveling with a dry cell battery-powered wheelchair. WCBW Passenger is traveling with a wet cell battery-powered wheelchair. BLND Passenger is blind or has reduced vision. DEAF Passenger is deaf or hard of hearing. ESAN Passenger is travelling with an emotional support animal. EXST Passenger requires an extra seat due to body size. MAAS Meet-and-assist. Used by some airlines to identify passengers with intellectual disabilities. MEDA Medical case. Used by some airlines to identify passengers needing oxygen. OXYG Passenger will require oxygen. PETC Passenger is traveling with a pet in cabin. PNUT Passenger is allergic to peanut dust. PPOC Passenger is traveling with a portable oxygen concentrator. STCR Passenger is traveling on a stretcher. SVAN Passenger is traveling with a service animal. Note: Passengers will need to call and have the relevant SSR codes added to the ticket at the time of booking or soon thereafter. Remember by giving the airline advance notice allows them and airport staff to better manage passenger requirements. PGran Canaria airport buses are usually equipped for people with disabilities. Generally they all are wheelchair accessible. However, at the airport you will have to put the wheelchair underneath in the luggage hold. Adapted taxis with electric wheelchair lifts are available for airport transfers. Accessible Taxis and Minibuses cost an extra 10€ per wheelchair. A very good company on the island is Sol Mobility. Sol Mobility. They have a small fleet of adapted vehicles offering transfers to and from LPA Gran Canaria Airport. Adapted vehicles to hire on Gran Canaria is still limited. Therefore, the one company providing adapted vehicles is Cicar. Check their website. This company has a wheelchair accessible van for hire with lowered floor, having a electrical platform for its incorporation into the vehicle. The vehicle is equipped to carry one passenger in a wheelchair + four further passengers. They also provide an Adapted Opel Astra which facilitates the transport of disabled persons. To make a booking telephone contact their reservations department via email info@cicar.com or by telephone at +34 902244444. If you wish to hire mobility equipment while on holiday, see Sol Mobility.